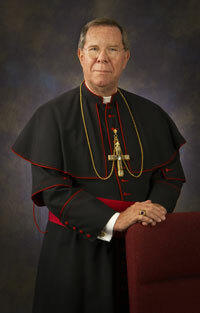 Archbishop Daniel M. Buechlein was the archbishop of Indianapolis for nearly twenty years. On Wednesday, September 21, 2011, he held a press conference at the Catholic Center in Indianapolis to announce that Pope Benedict XVI had accepted his early retirement due to health reason. In March 2012, he celebrated his 25th anniversary of becoming a bishop; in 2014 he celebrated 50 years of priestly life. He died at Saint Meinrad Archabbey on Jan. 25, 2018.